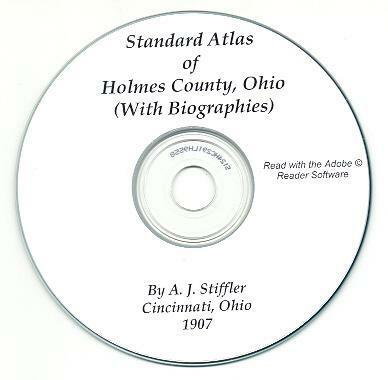 The book, "Standard Atlas of Holmes County, Ohio - To Which is Added an Authentic History of the County, Historical Sketches of Each Township and Village, a Directory of Each Township and Village, Biographies and Portraits of Representative Men and Valuable Statistics, Etc. 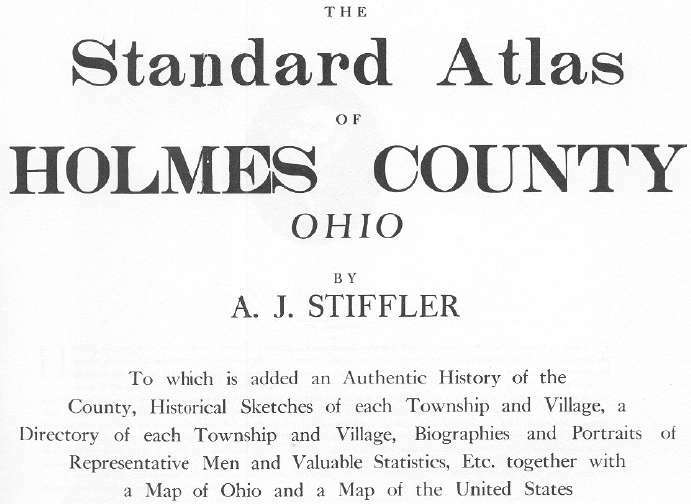 Together with a Map of Ohio and a Map of the United States," by A. J. Stiffler, published by The Standard Atlas Publishing Company, Cincinnati, Ohio, 1907. Please note: This is not a paper book, it is a scan of the original paper book into the digital Adobe PDF format, written on a CD-ROM. You read this book on your computer using the free Adobe Reader software. It is a digital version of a hard to find book. If you could find a copy of the 1907 printed book, it would be very expensive. 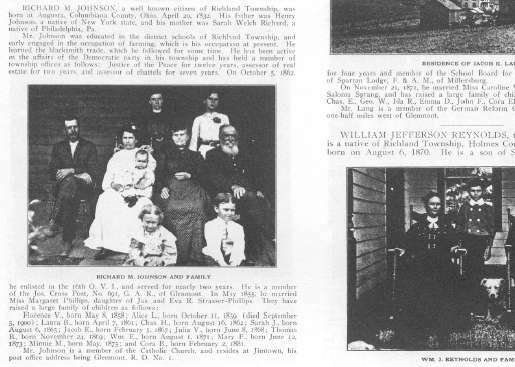 Edward Ackert; George Adams; W. W. Adams; John E. Albertson; Rachel Albertson; Joseph Alexander; S. L. Allison; Theodore M. Allison; W. D. Allison; Robert J. Anderson; S. D. Anderson; L. J. Bahler; John W. Baker; George Barnes; Lewis G. Barton; John J. Beechy; Sybil M. Beegle; Andrew J. Bell; Jacob Bell; J. J. Bell; S. D. Bell; Samuel J. Berger; Milton G. Bird; Jonas Bitchy; Cornelius Bitikofer; John G. Boling; Joseph Borden; Alphonse Bresson; Amos M. Burkey; John Burkey; Charles R. Cary; H. W. Cary; James J. Calhoon; John H. Calhoon; Dr. F. D. Carson; Henry Campbell; Harry L. Clark; I. D. Cline; Dr. Albert T. Cole; Glenn G. Cole; David Collier; John H. Conrad; John J. Conrad; Josiah G. Conrad; Sol W. H. Conrad; Rev. Joshua Crawford; Col. William Crawford; Lyman R. Critchfield; Lyman Critchfield Jr.; William P. Critchfield; Elias Crum; P. H. Damon; P. M. Deetz; Robert S. Dewitt; Maj. Thomas T. Dill; William Douglass Ditmars; Daniel J. Domer; Mrs. Solomon Drushel; Elijah Duer; C. V. Edwards; Harvey Emmons; Albert Fair; Eli Fair; Jacob P. Fair; Nathaniel Fair; S. B. 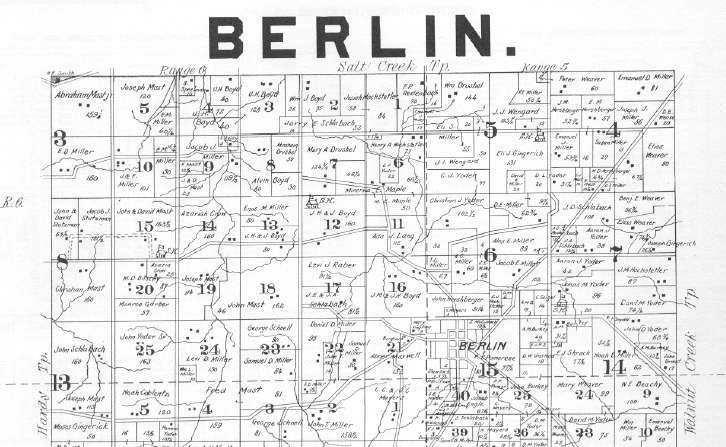 Fair; B. C. Fisher; Christian Fisher; Peter Fisher; C. C. Fisher; David Fites; Henrey Fites; C. O. Fritchle; A. C. Fry; Ira Funk; W. S. Funk; William F. Garver; Charles Geib; Seth Gerber; Jacob Getz; Florien Giauque; George Gray; John Hamm Jr.; A. J. Hanna; W. S. Hanna; Dr. John Hart; Hartz Family; G. B. Helmuth; M. M. Herron; N. J. Hershberger; Dr. Jacob Heyde; John Heyde; A. H. Hochstetter; William Hoerger; George Hoff; John Horn; Henry Huffman; F. M. Hughes; Joseph Jackson; Richard Johnson; Andrew Johnston; John Stewart Johnston; William Johnson; Samuel Jones; George Kantzer; Adam Karch; Charles Matt Karch; Henry Pounds Karch; C. E. Kaylor; Frederick Kinsey; John Koch Jr.; Charles Kochenderfer; Edward Otto Koehler; George Koehler; Henry Jacob Koehler; Jacob Benjamin Kopp; Simon P. Kopp; J. J. Korn; John Krieger; John William Krieger; Jacob Lang; Henry Lange; Henry Ledrick; L. D. Leeper; Dr. W. A. Lewis; James Lint; A. W. Logsdon; Gleen Lovett; John McClure; John A. McDowell; Joseph McHarris; A. D. McMillen; John C. McMillen; John McMillen; Dr. J. R. Mackey; Sanford Henry Marchand; McC Martin; Benjamin Mast; Fred Mast; Scott Mast; John Maxwell; Louis Mayers; William Meier; Louis Miley; Daniel Miller; Eli Miller; Isaac Miller; Jacob Miller; Jacob J. Miller; Jacob M. Miller; Leander Miller; Peter J. Miller; William Miller; Samuel Miller; James Nelson Moore; John Mutchelknaus; E. Negelspach; Henry Negelspach; Ross Palmer; C. D. Parkinson; James Patterson; Misses Perdue; Henry F. Pounds; Zachariah Powelson; George Priest; Silas Pyers; William Raby; William Reed; William C. Reed; Julius Regne; William Reynolds; H. H. Robinson; Margaret Ruble; Jacob Schmidt; Jacob Schneider; George Schnell; John Schopfer; John Schreiber; Noah Schrock; Carl Schuler; John Schuler; Michael Schutt; John F. Schwartz; John Schweir; John Schafer; John Shafer; Levi Shaffer; George Sharp; James Shaw; Joh Shutt; A. J. Silcott; V. J. Simon; John G. Smith; Joshua Sponogle; Wallace Sprang; Jacob Spreng; A. W. Stantz; A. J. Stiffler; John Stiffler; Michael Stiffler; Newton Stilwell; W. Stilwell; William Stingel; Albert Strang; J. J. Strome; C. W. Stuber; Dr. J. Stucky; J. J. Sullivan; Dr. R. H. Sunkle; Rhucann Tharpe; James Thompson; John P. Thomas; E. R. Thornburg; Jonathan Tipton; Robert Torbet; Mills Troyer; M. D. Troyer; John Tschantz; Alfred Uhl; A. 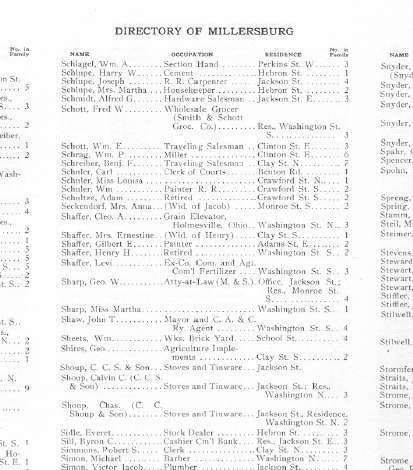 A. Uhl; Jacob Uhl; L. E. Uhl; John W. Ulrich; Louis Vogel; Michael Vogel; Benjamin Weaver; Joseph Weaver; Edward Weimer; George W. Weimer; Charles R. White; Dr. S. P. Wise; J. D. Wolf; John M. Yoder; B. J. Young; G. W. Young; and Phillip M. Young. 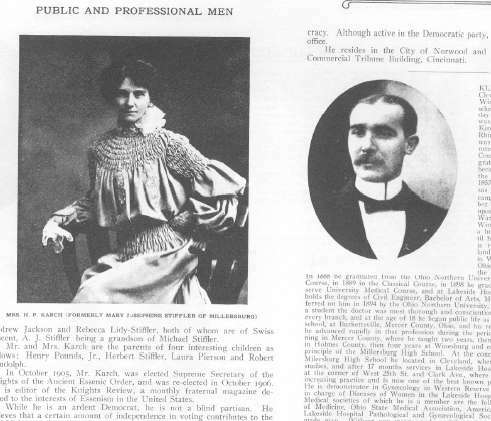 There are many more individuals in photographs and biographical sketched - the index does not list all family members, usually just the male head. There are many female and junior male family members not listed here. The township plats have too many names for me to duplicate. The book has about 138 pages and a 5-page Appendix. 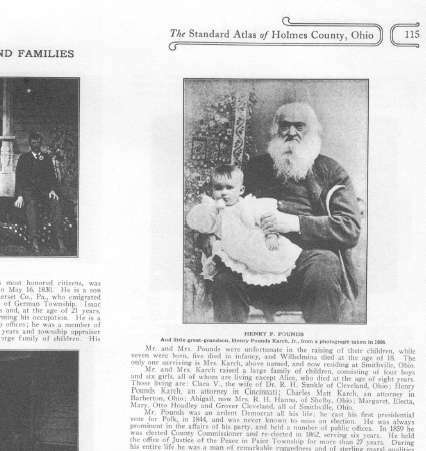 There are numerous illustrations of Holmes County scenes and residents. There is no Index, but the Table of Contents is fully linked to the pages so that you can easily browse the book using the Adobe Reader software (included).